The handset is powered by an 1GHz 64-bit quad-core MediaTek MT6735P processor along with a 600MHz Mali-T720 GPU. The processor is coupled with 2GB RAM. It comes with an internal storage of 16GB. You can expand the storage space to an additional 32 GB using a microSD card. The device runs on the Android 5.1 Lollipop operating system. 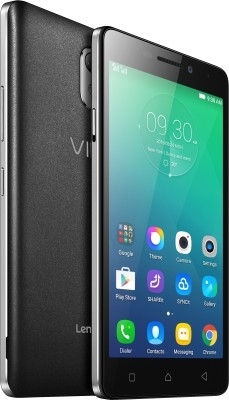 The Vibe P1m features an 8MP rear camera with LED flash and a 5MP front facing camera. You can click noteworthy photos and selfies with the auto focus camera. It supports Full HD video recording with a resolution of 1920 x 1080 pixels. The dual-sim smartphone supports 4G LTE and 3G HSPA+. Other connectivity options include GPRS, EDGE, WiFi 802.11 b/g/n, Bluetooth v4.1, A-GPS, micro USB and OTG support. The handset is backed by a powerful 3900mAh Li-Polymer battery. The battery provides a talk time of 36 hrs on 2G and 16 hrs on 3G and a standby time of 456 hrs on 2G and 552 hrs on 3G. The device is equipped with a manual power saving switch that lets you extend battery life by disabling functions other than call, SMS and clock. It also features Quick Charge function by which you can quickly boost your device's battery by just plugging it in for a few minutes.